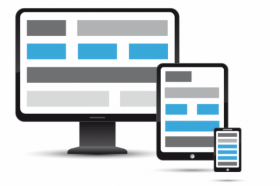 Responsive web design provides the optimal experience from any device. As the use of smartphones and tablets for internet browsing increases, so does the importance of a mobile-friendly, touch-friendly "responsive" website. This is especially true for real estate, where users often look for listing data on the go. Responsive web design is an approach to web design aimed at crafting sites to provide an optimal viewing and interaction experience—easy reading and navigation with a minimum of resizing, panning, and scrolling—across a wide range of devices. Redplug has just finished an 80+ hour development and implementation of a new responsive footer system. Whether you browse with a mobile phone, tablet, laptop, or desktop, and whether that device has a mouse and/or is touch-capable, you'll receive an optimal user experience. The footer features clean unobtrusive touch-friendly buttons with icons that clarify intent. For narrow-width devices, the buttons stack up on top of one another. The footer can easily be extended to add or remove content. Its design/style can also be customized easily in edit mode, or by a Redplug developer. The new footer takes Redplug one step closer to our goal of 100% fully-responsive, mobile-friendly, touch-friendly real estate websites. This upgrade was pushed to all Redplug real estate websites at no charge.